I think I first heard of OpenStreetMap at the conference Wikimania 2008 in Alexandria, Egypt. Essentially it is a Wikipedia for maps: “The free wiki world map”. And they are quite far. But you still can make some contribution before the entire world is mapped. A MediaWiki extension called Simple image MediaWiki Extension seems to allow one to include images of this kind in MediaWiki wikis. The main site of OpenStreetMap makes quite good renderings. Whereas some commercial interactive Internet maps do not quite like my Ubuntu and Debian Konqueror Web browser the OpenStreetMap suffers no such problems. And that goes for printing as well. Not all of the world is well-mapped. The village of Ørum lacks several streets. 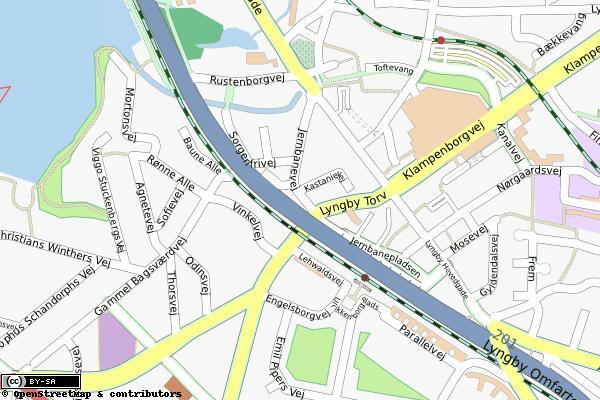 However, Kongens Lyngby is detailed mapped. I guess the nerd density is higher in Kongens Lyngby with the Technical University of Denmark nearby: With sufficient zoom one can see street numbers, cafes, sushi restaurants, and the small path between Sorgenfrivej and Baune Alle with all its staircases, – no small footpath missing! This entry was posted in programming and tagged map, openstreetmap. Software is often accused of having bad usability. However, many household items with far less functionality may also suffer. Video tape recorders are usually pretty bad, but even refrigerators can be silly. There are only a few features in the standard human-refrigerator interaction: The door and its handle, the light, the fruit boxes, the shelves and the regulator. The door and adjustable shelves and the boxes are quite straightforward and the light that switches on when the door opens is a marvelous invention. It leaves the regulator. Our old refrigerator has a min-max regulation. But what is min? Temperature or effect? Well, probably temperature, but a more informative marking would say cold-hot or display blue-red markings. This entry was posted in technical and tagged usability. This entry was posted in Uncategorized and tagged debian, etch, lenny, nvidia, upgrade. A Nobel prize in imaging? Thomson Reuters has announced their prediction for the 2009 Nobel prize. Among them is Seiji Ogawa. He is indeed a good guess as the pioneer for functional magnetic resonance imaging, that is now much used in cognitive neuroscience. Ogawa was not the first how did functional neuroimaging. Niels A. Lassen and David Ingvar were quite earlier – almost too earlier for their technique to have impact on other laboratories. Much of initial functional imaging (some 10-15 years) was performed with positron emission tomography (PET). Whereas there have been Nobel Prizes for MRI and CT scanning, there haven’t – as far as I recall – been a Nobel Prize for PET – or SPECT for that matter. Another development that could deserve recognition is Fludeoxyglucose (FDG). Whereas fMRI is still a bit of a toy for scientists the combination of PET and FDG is dead serious forming the work horse for advanced cancer imaging. I am not too much into the history of FDG but Alfred P. Wolf and Louis Sokoloff seem to have been important contributors. For PET David Kuhl and Michael Phelps are often mentioned. Since PET predates fMRI and PET is used much in oncology – not just cognitive neuroscience – it might be that the Nobel goes to PET instead of fMRI, – if a Nobel Prize in Physiology or Medicine is awarded for imaging at all. This entry was posted in Uncategorized and tagged fmri, imaging, neuroimaging, pet, spect.